READY FOR THE PARTY BUS? H-Town Party Bus is your go-to luxury and entertainment transportation company for the Greater Houston area. Many of you are likely familiar with our fleet, our helpful staff members and our still-competitive rates. We welcome you back! To those just becoming privy to our services and company, in general, we'd like to give you a warm welcome, as well. We continue to grow to service all of you better and we've attempted to assist you in every way that we could think of with this new website. Everything that we do around here is for our clients' convenience. When you're planning the details of an important date, it's nice to have at least one aspect of that planning that is relatively painless. 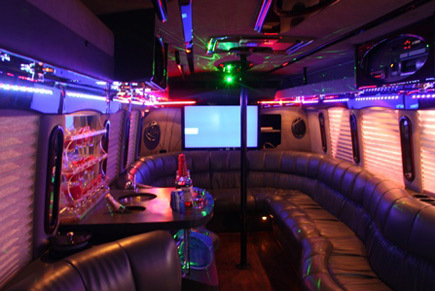 Well, we are the stress-free service provider for all of your party bus needs. We service a large area, we've now built a fleet that can take on any type of event or group and we've hired even more of the area's smiling faces to help tend to your questions and feedback better. Why are growth in the past few years is important to you is because the need for Houston party buses and things of the like has really skyrocketed recently. A growing number of people continue to visit our beautiful home town and a larger number of people are permanently moving here, as well. That means that life events such as weddings and birthday parties need to be serviced by us even more and so do the tours of the area by those hoping to get to know the metropolitan area better. You need a company that can handle such a demand and do so in a reliable manner. 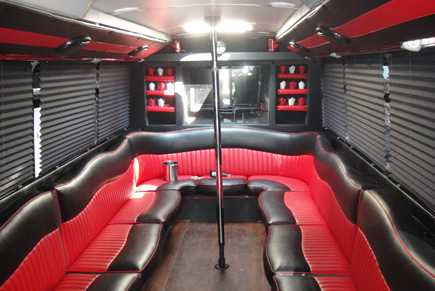 Have a look over our Houston Party Bus site and give us a call at any time - we are always open. You will find all of our Party Buses on our site, all of the Houston-area communities that we serve and our Pricing Policies herein. We sincerely hope that the work we've put into this collection of Houston Limousine web pages makes your party bus rental process a bit easier! We really serve all types of events out here in the Greater Houston area, and it doesn't matter whether it's a personal party or a corporate event! We do it all. We've got a giant array of vehicles for you to choose from and there's always something that is just ideal for your needs. We understand that every group and every outing is different and we're more than pleased to customize your trip to your needs. We do lots of DAY TOURS for our customers, which consist of heading out for an all-day trip with multiple stops. Some of the most popular destinations for these types of outings include Armand Bayou Nature Center, Sylan Beach Park, the Martyn Farm House, Bear Creek Pioneers Park and George Bush Park, just for starters. We also have lots of requests for museums and wine tastings and other such events. Wherever you'd like to go with your group, just give us a call! On that note, NIGHT TOURS are quite popular too, especially around Halloween when people want to get a little spooky! Hit up your favorite local bars while in costume, head out to a hayride, and even visit the Haunted Mayfield Manor! At any time of the year, it's plenty of fun to do some bar hopping and try the best restaurant that the city has to offer. In fact, our entertainment features in our buses are so impressive, it's much like a club! You might not even want to leave the vehicle when you've got your own private VIP room on wheels! Houston SPORTING EVENTS are a great reason to take advantage of our services too. With so many great teams playing in our area, why not cut out all the hassle of traffic, navigation, and parking and instead just have the ultimate tailgating experience with us? Maybe you want to head out to Reliant Stadium. Maybe you want to see the Rockets play or maybe the NHRA at Houston Motorsports Park, or maybe even the Houston Livestock Show and Rodeo! We can take you there and you will have such an amazing time. If you're celebrating your union with your loved one for your beautiful WEDDING DAY, we'd love for you to know that our vehicles are so ideal for that day. Choose an elegant bus in crisp white and enjoy the trip between the wedding venue and the reception hall, and maybe even to your honeymoon destination if it's local! It's wonderful to be able to have your entire wedding party traveling in one vehicle, removing the headaches of traffic and navigation, and just enjoying that special time together that would otherwise be wasted driving. Finally, HOMECOMINGS AND PROMS are perhaps the smartest time to give us a call. That's because your teenage children are at risk of distracted driving at these special times, and while they will just feel completely spoiled and pampered by our transportation services, you'll be relaxing at home knowing that you're taking really good care of them. It's a worry-free night for you and really fun night for them. Safe and secure, with special rates offered just for those times of the year!